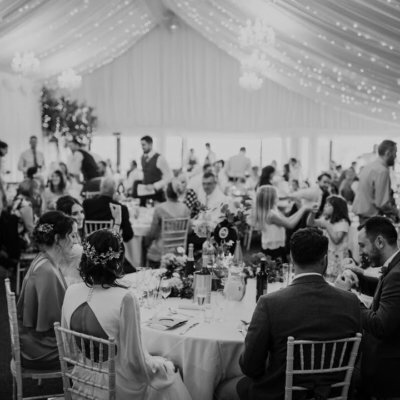 Lois & Ashley planned their September wedding with the possibility of an outside ceremony in the Orchard Pavillion. 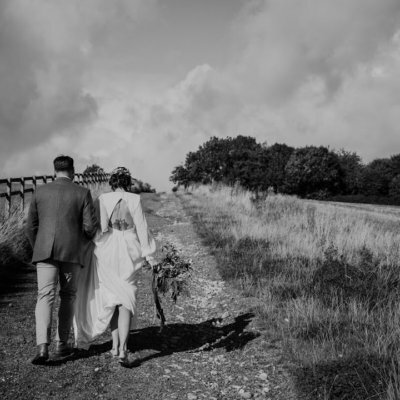 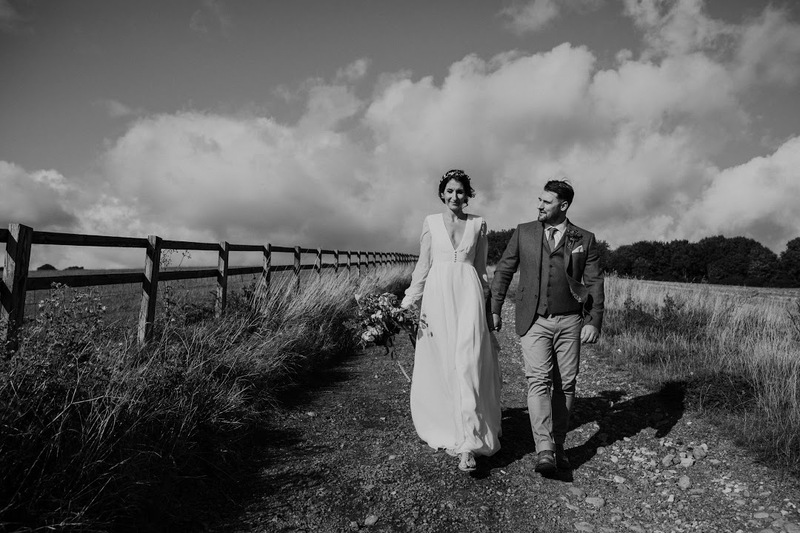 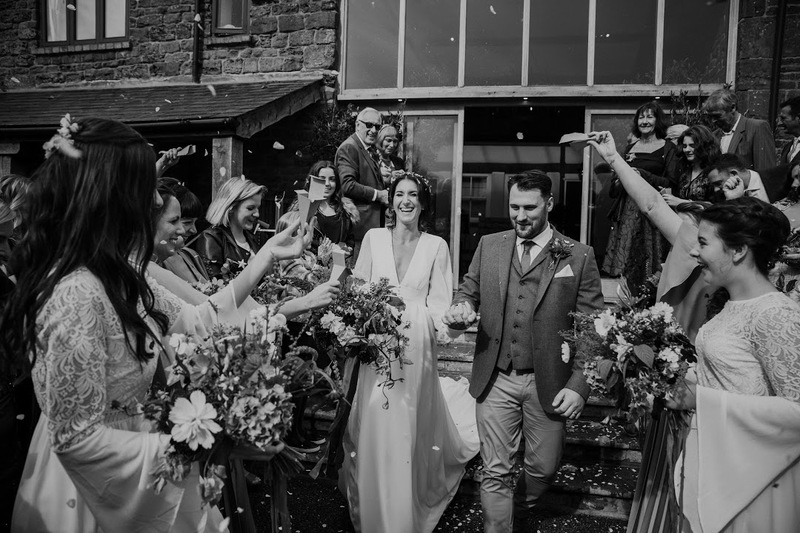 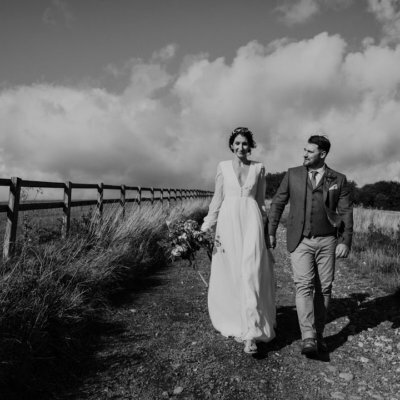 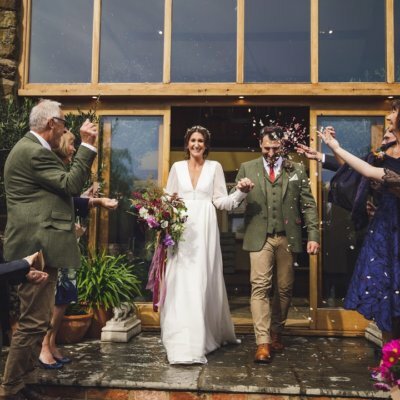 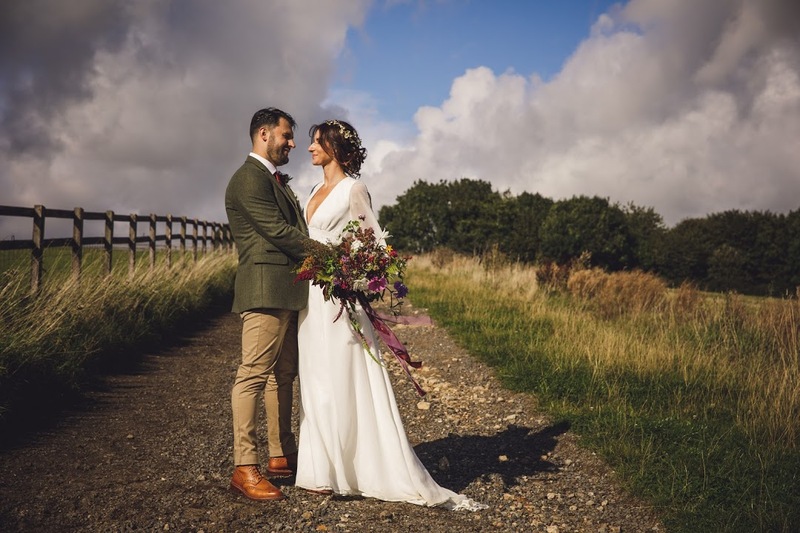 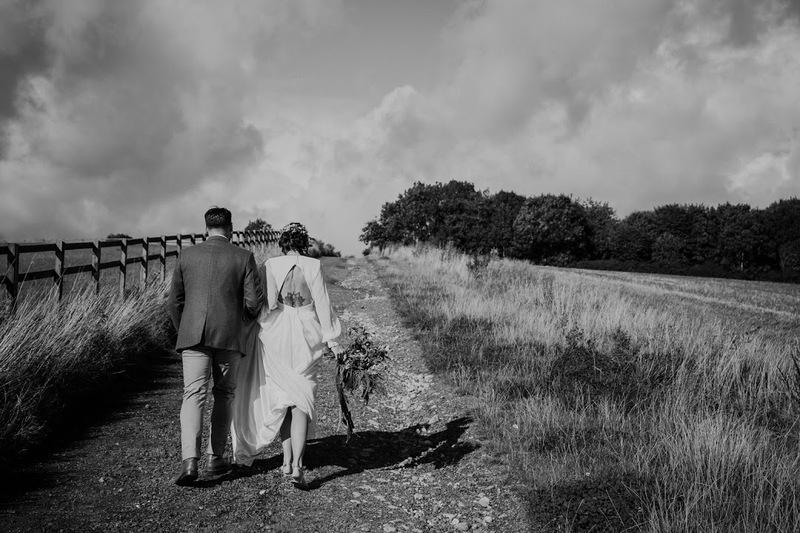 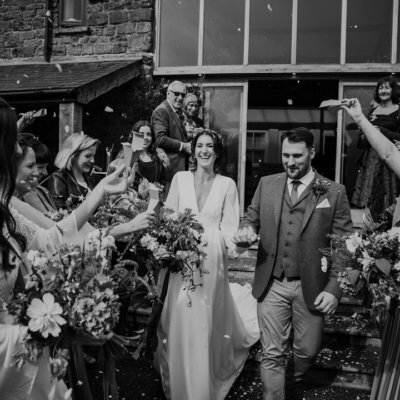 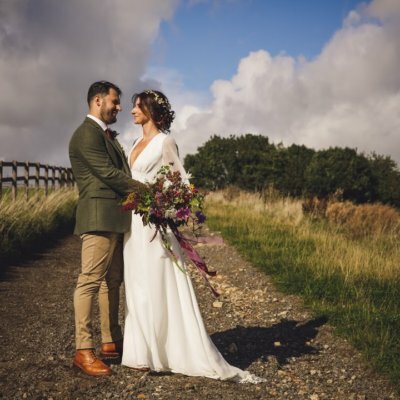 Unfortunately the weather didn’t cooperate, but this didn’t detract from their day with the couple instead marrying the stone vaulted barn which looked stunning with flowers from local florist Chloe at Bare Blooms who uses seasonal and sometimes wild flowers to create natural arrangements and bouquets. 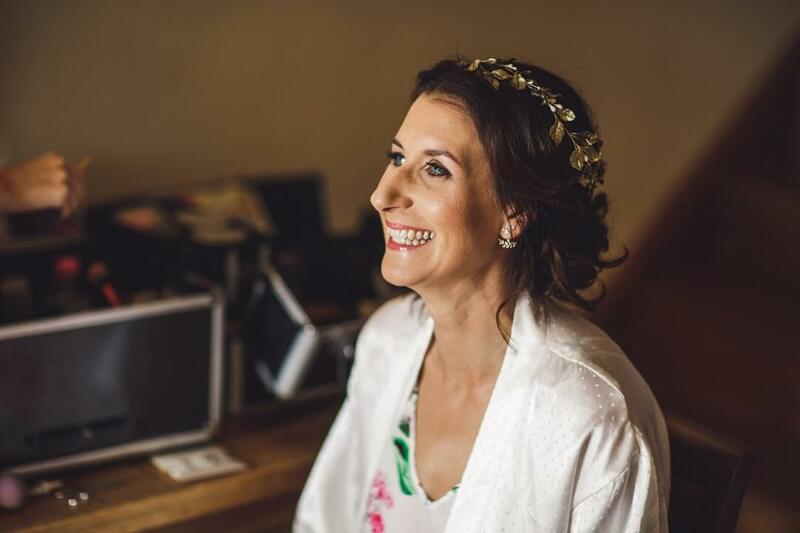 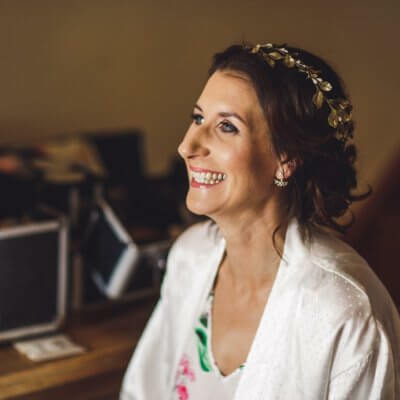 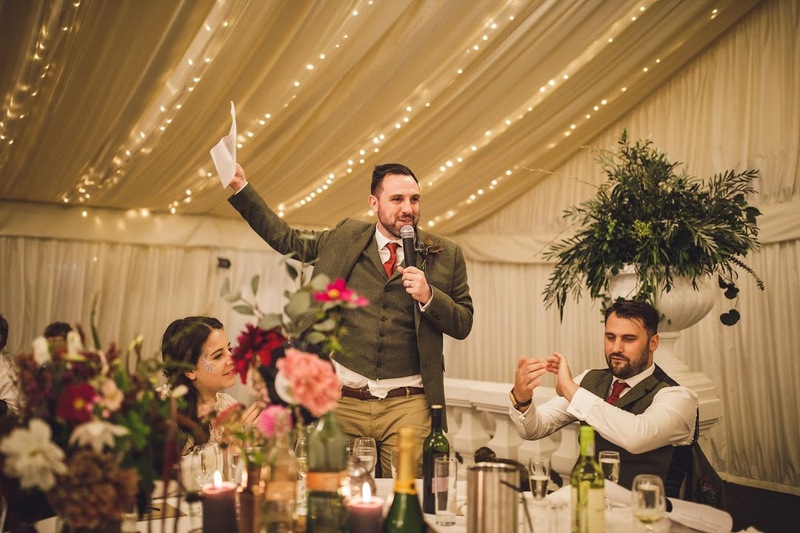 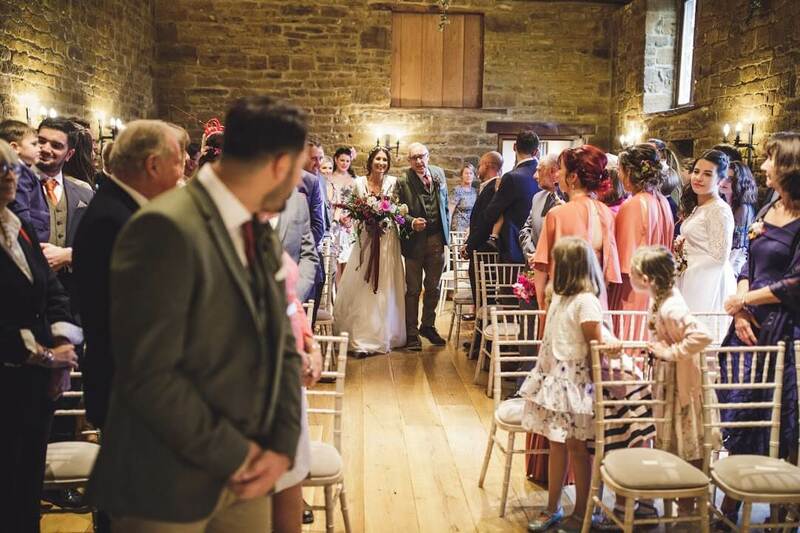 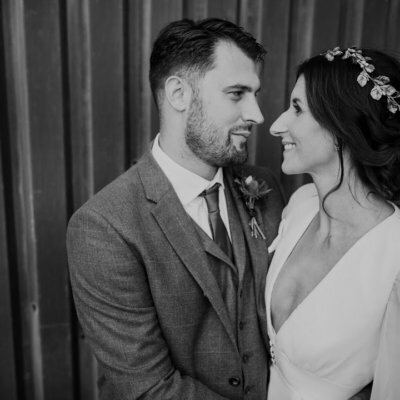 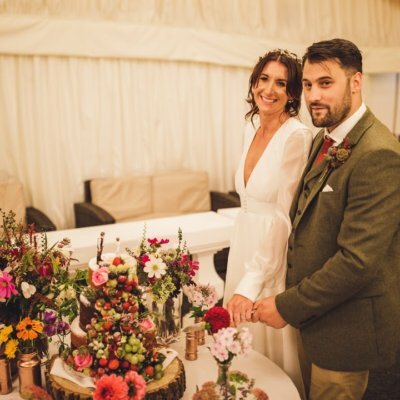 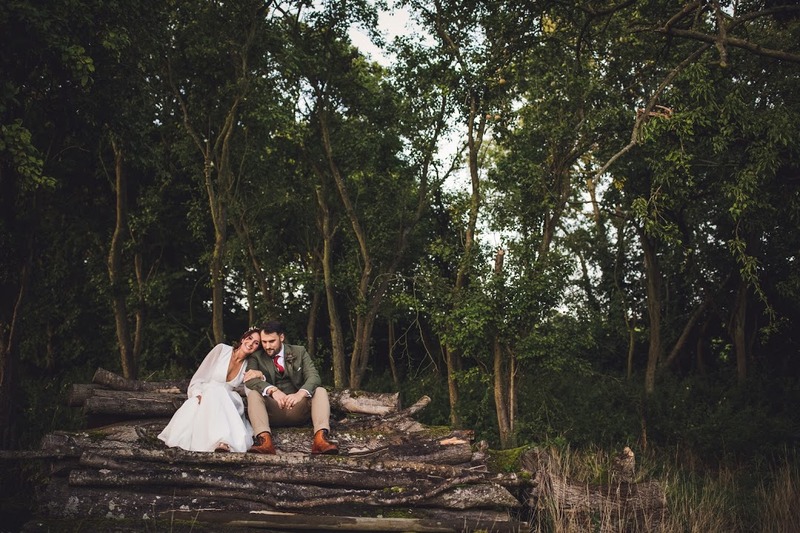 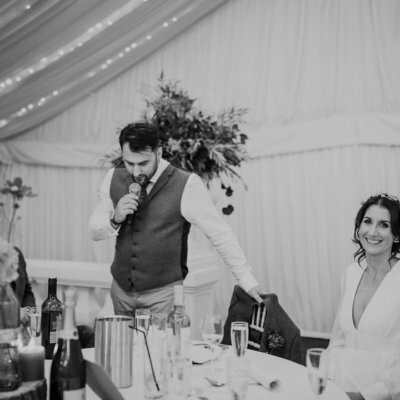 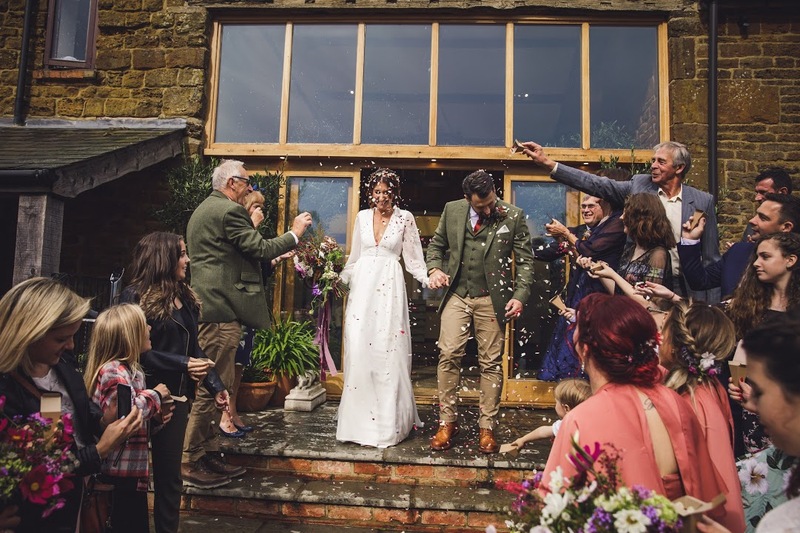 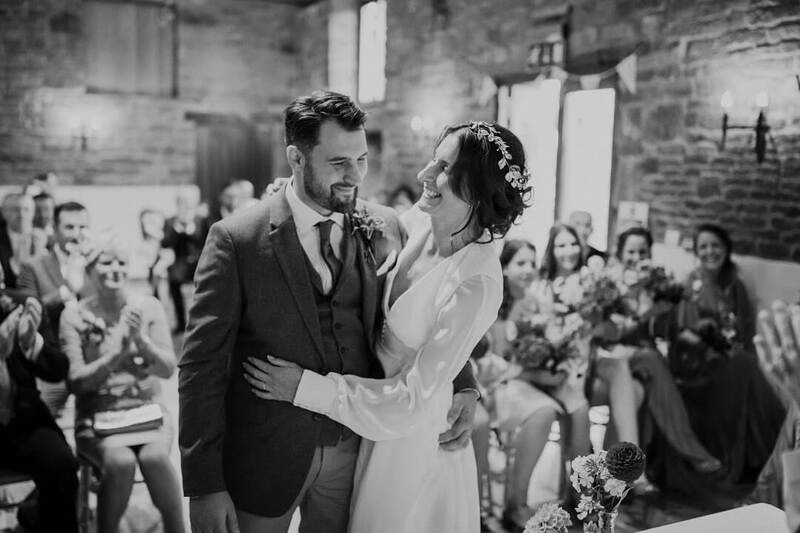 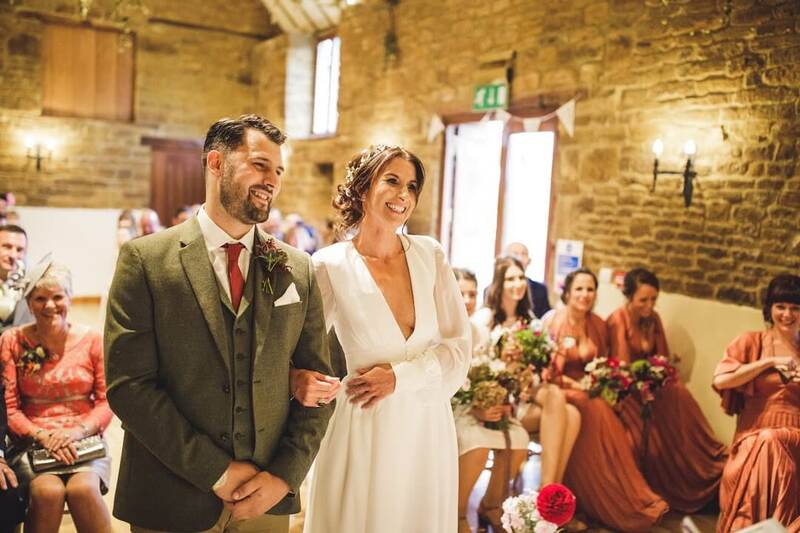 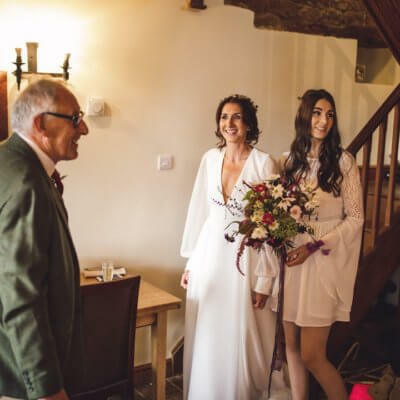 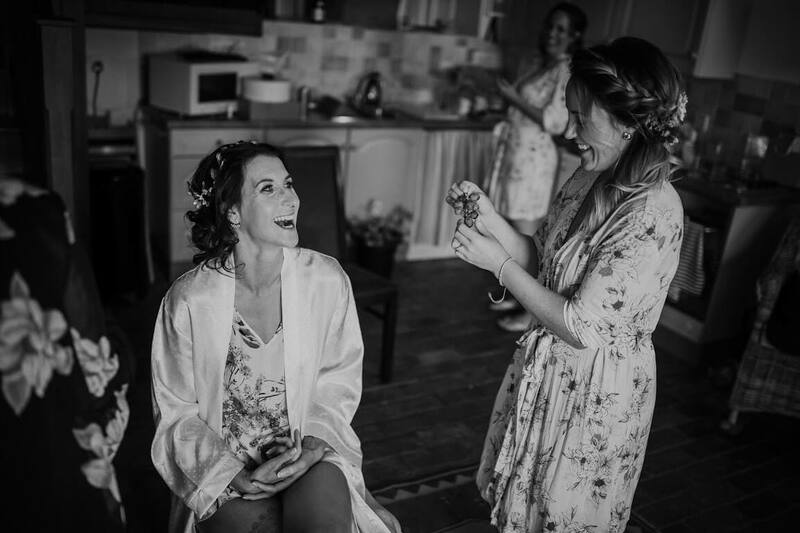 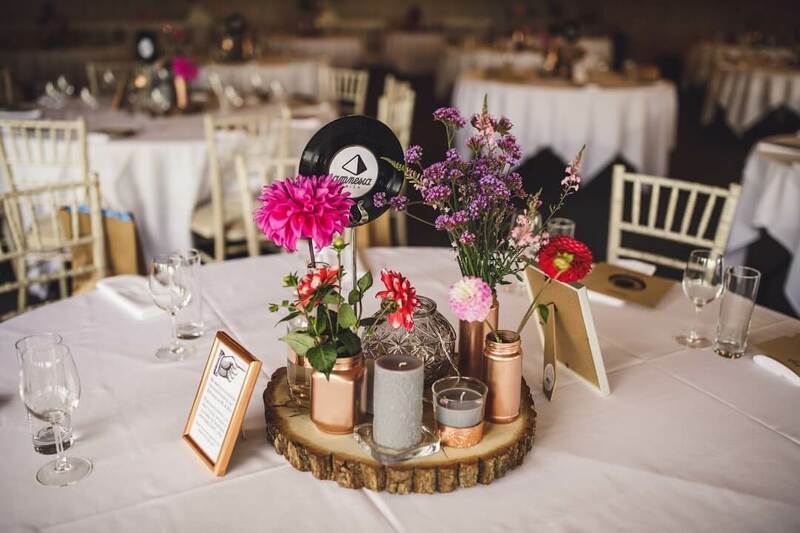 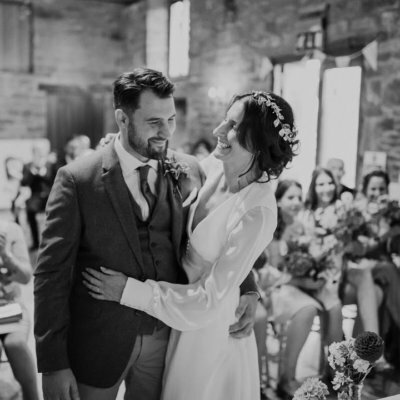 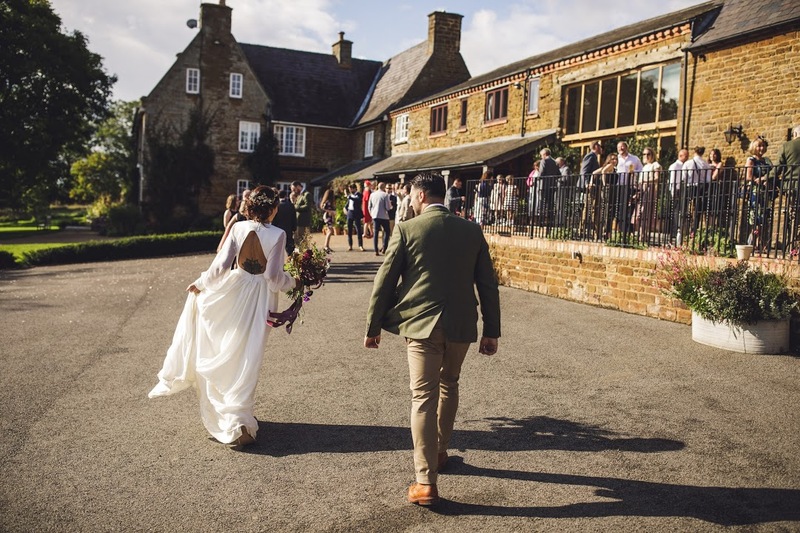 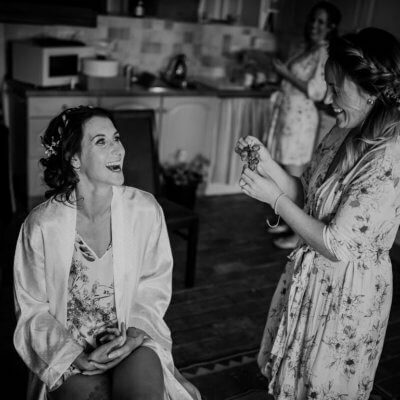 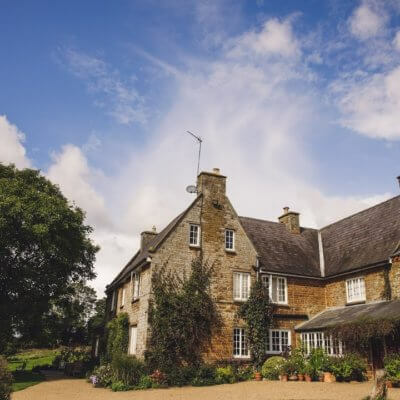 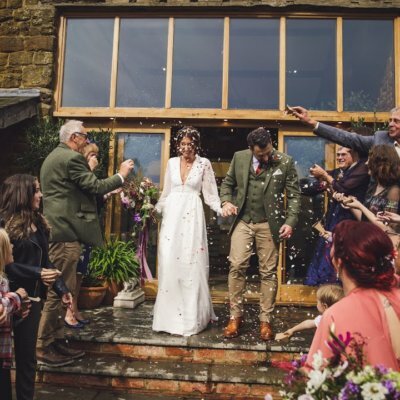 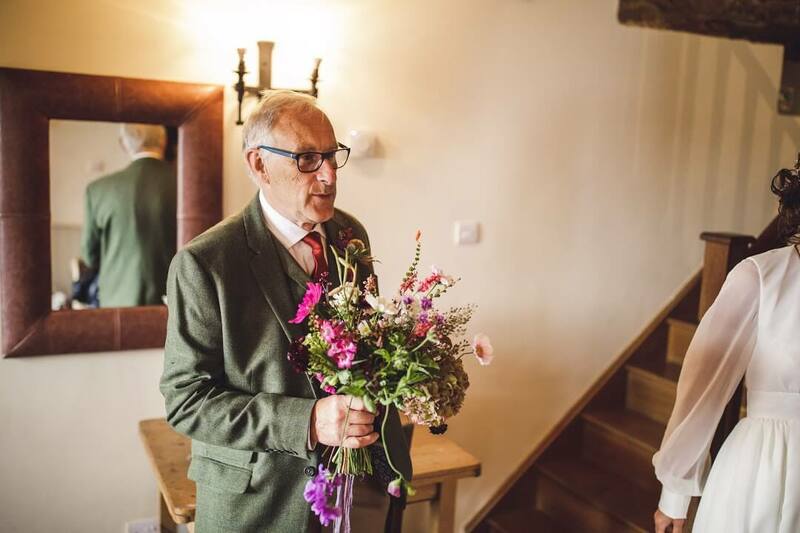 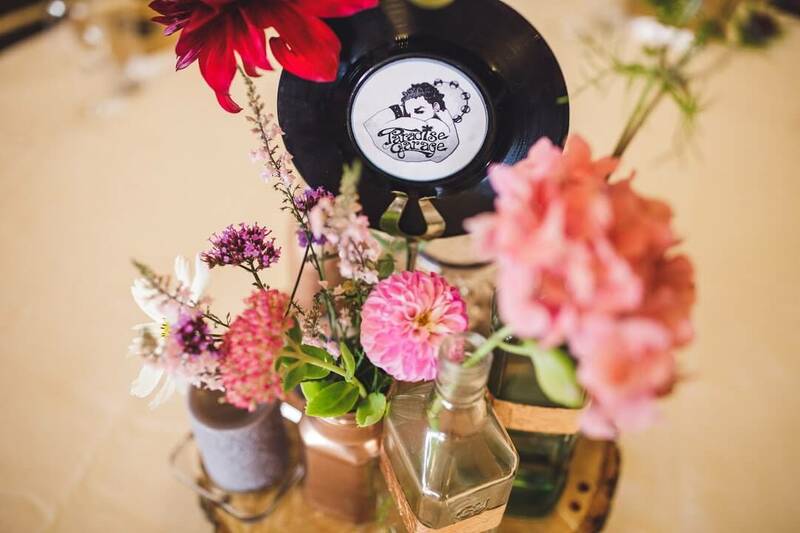 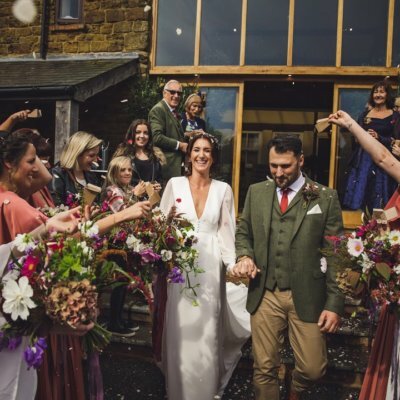 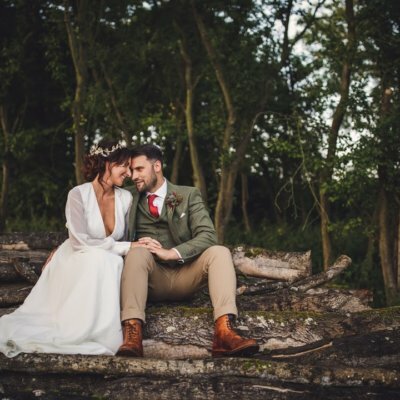 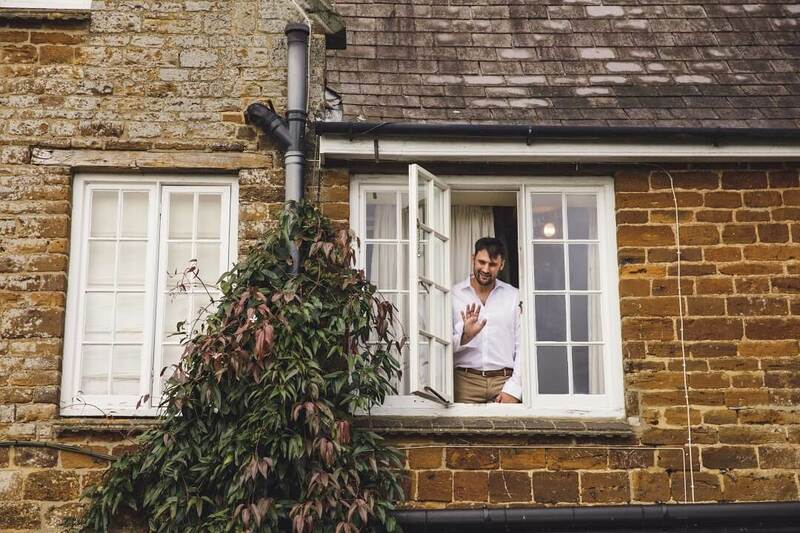 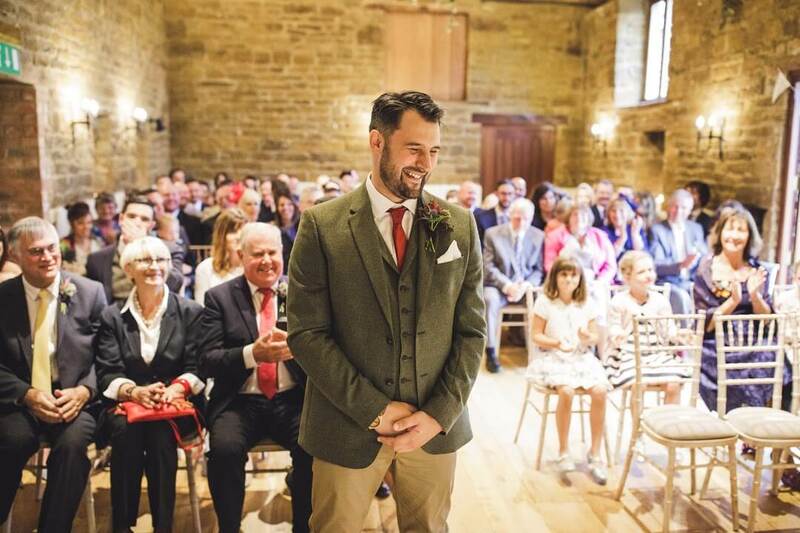 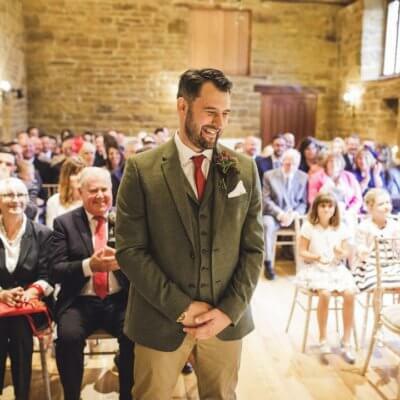 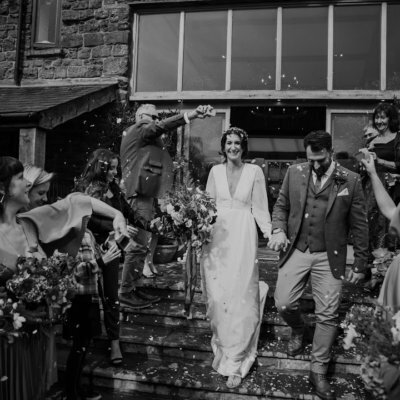 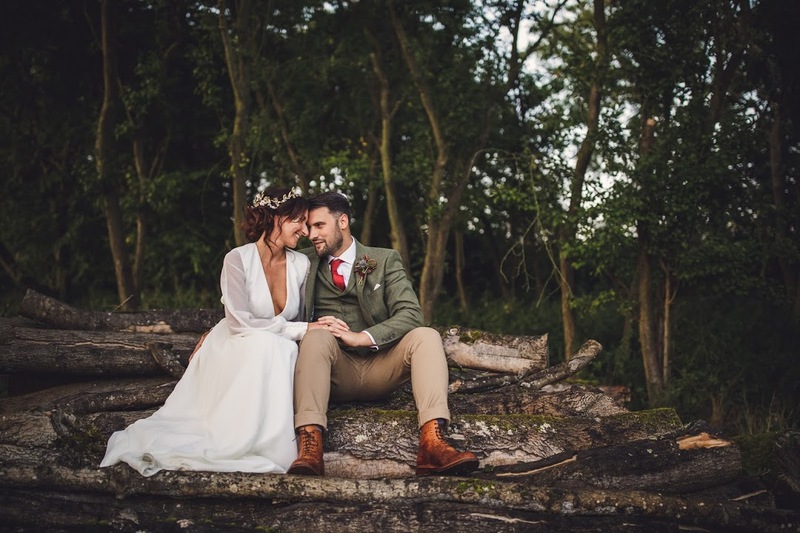 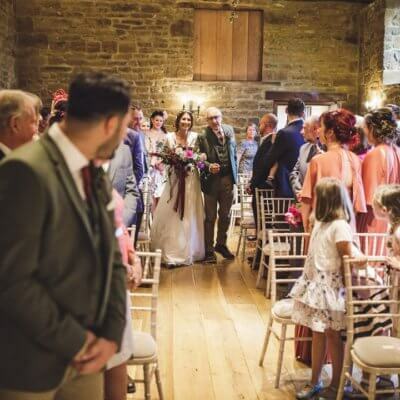 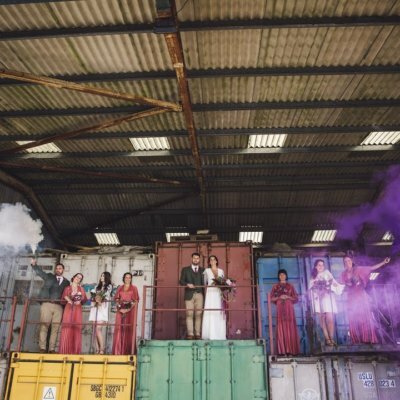 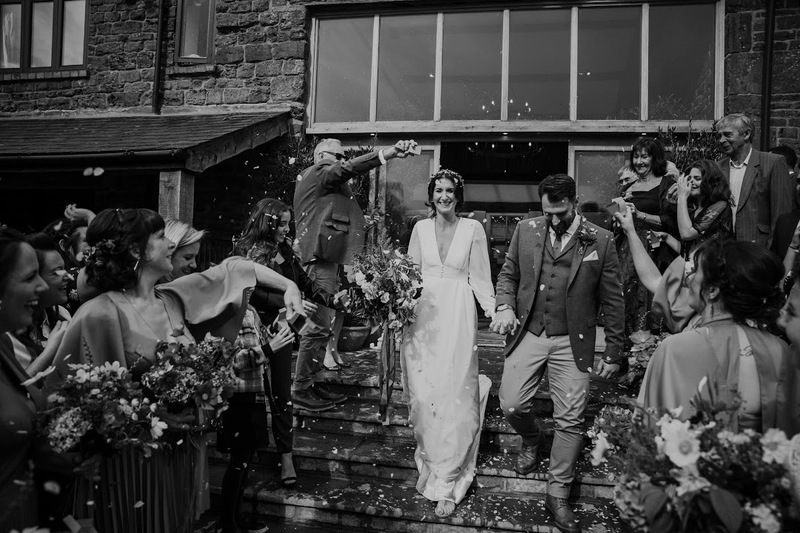 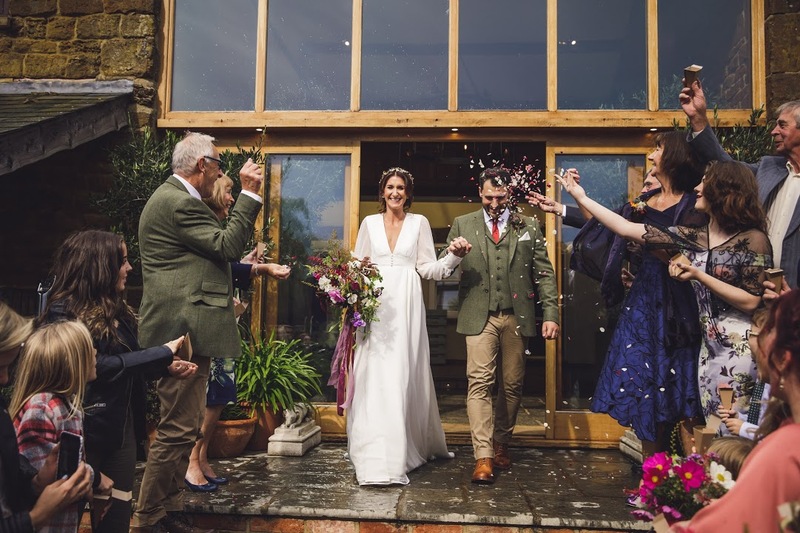 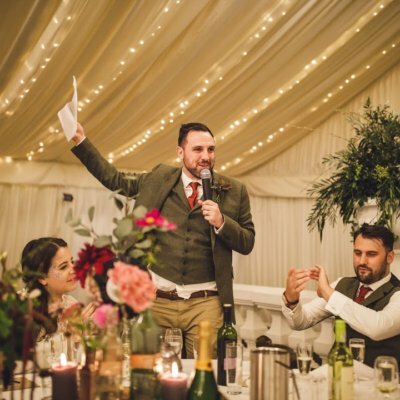 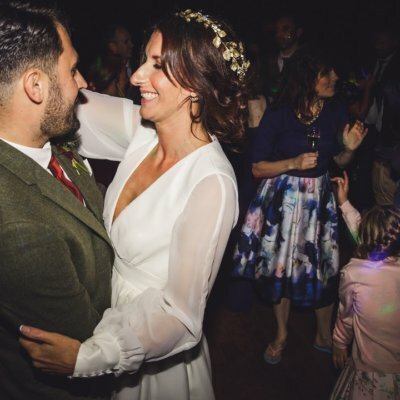 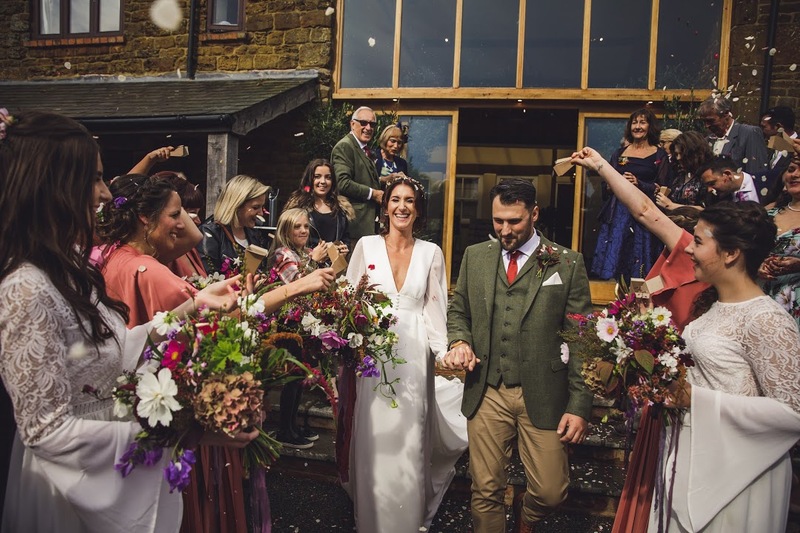 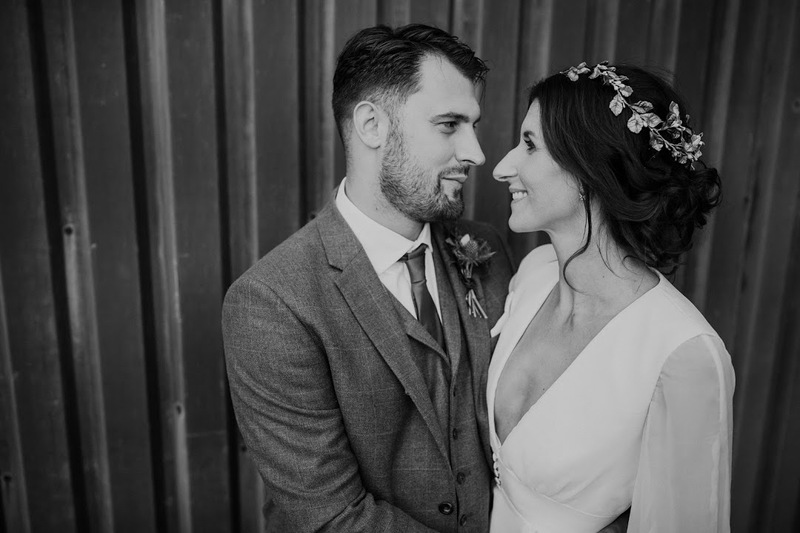 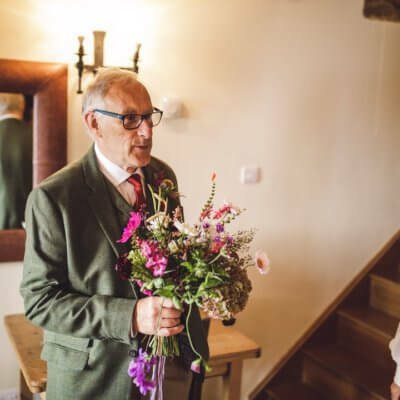 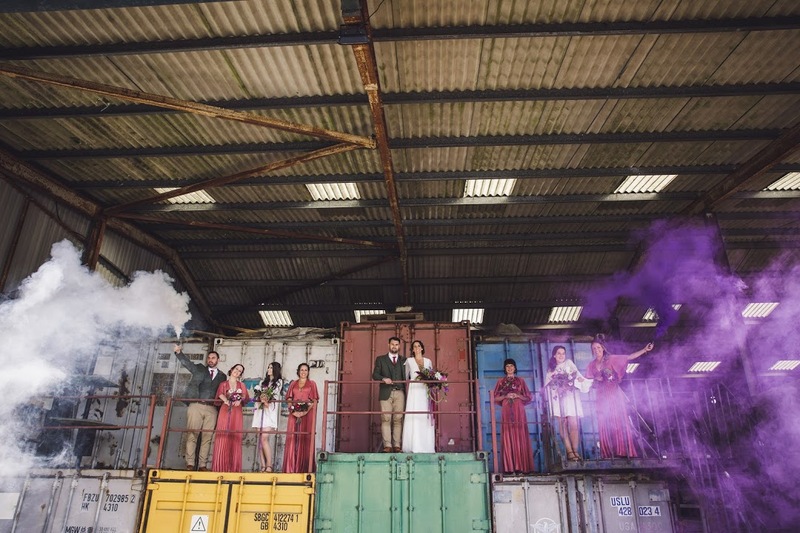 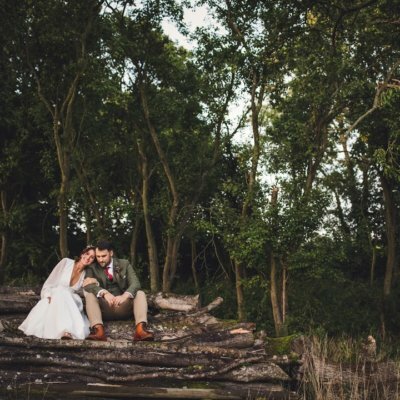 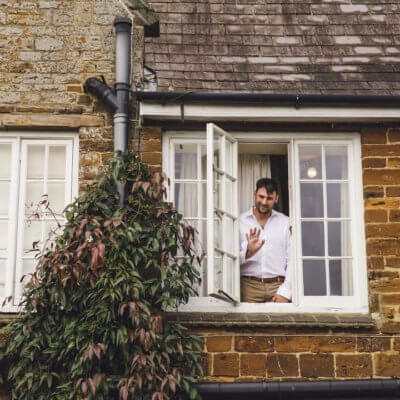 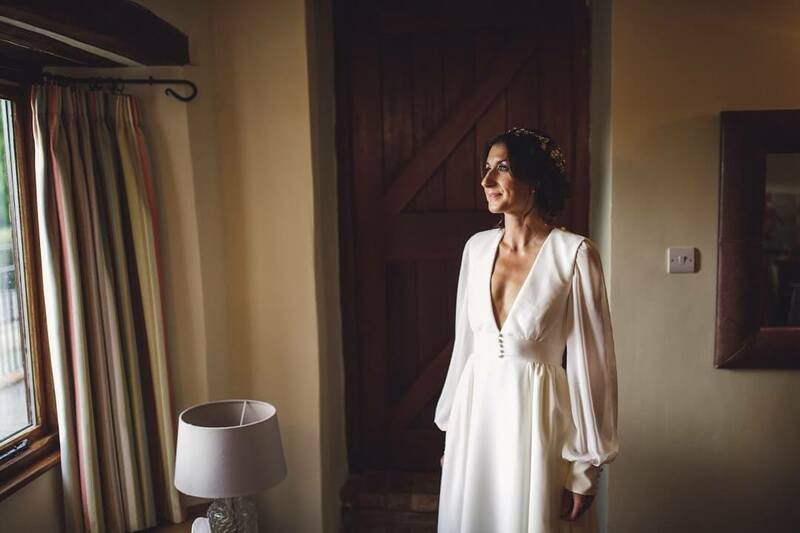 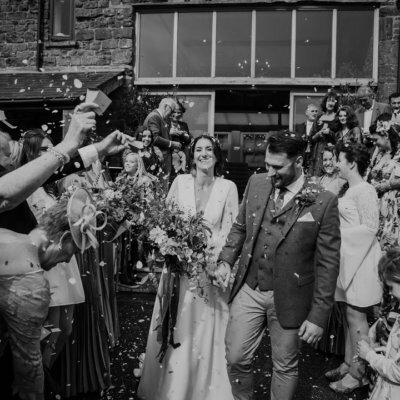 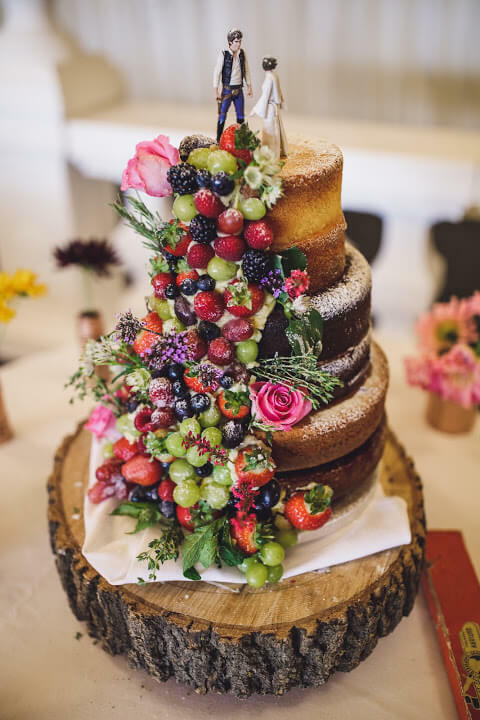 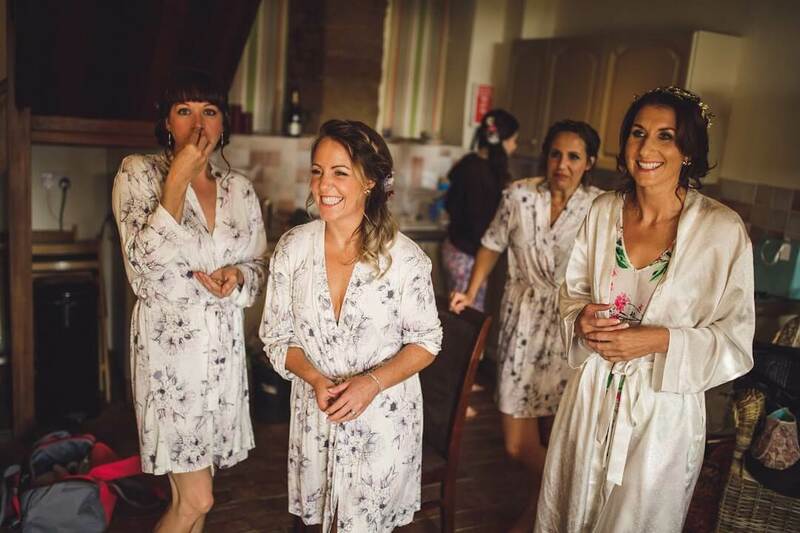 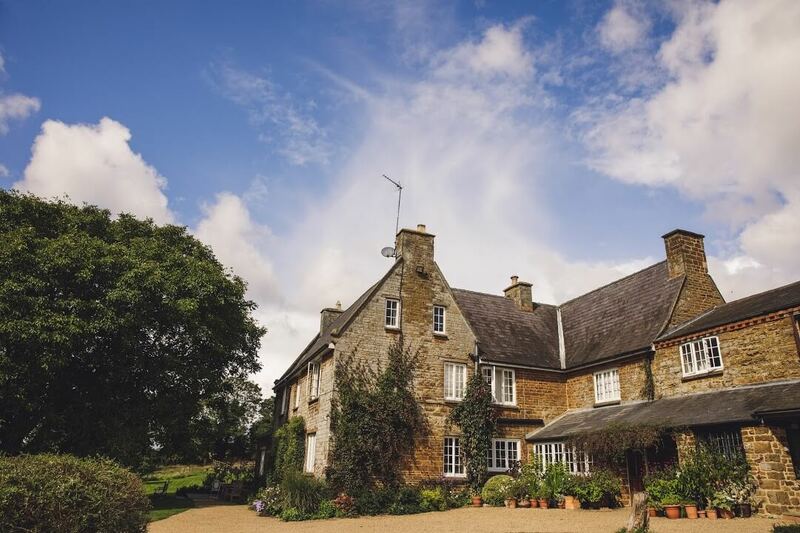 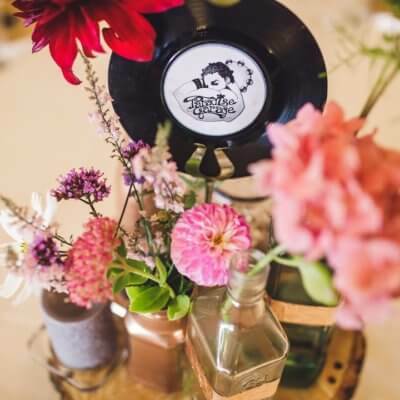 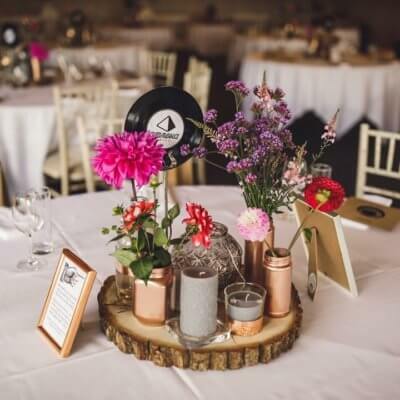 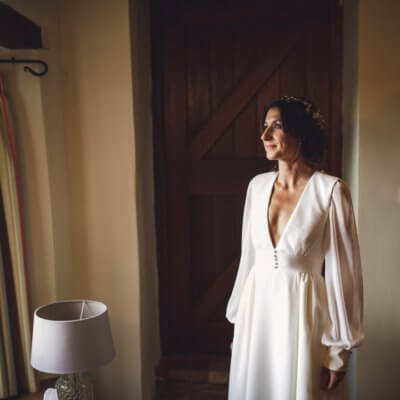 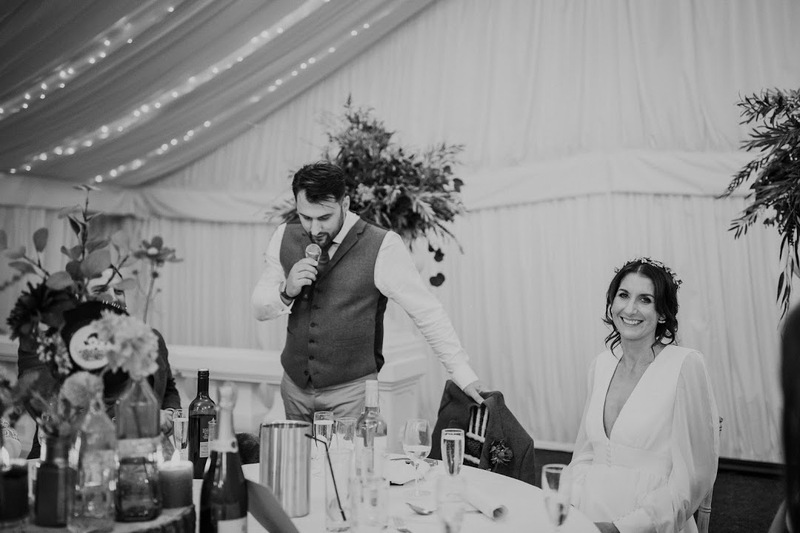 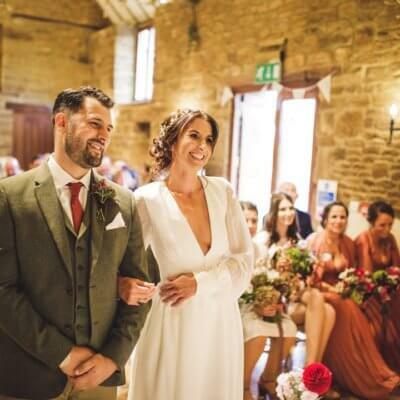 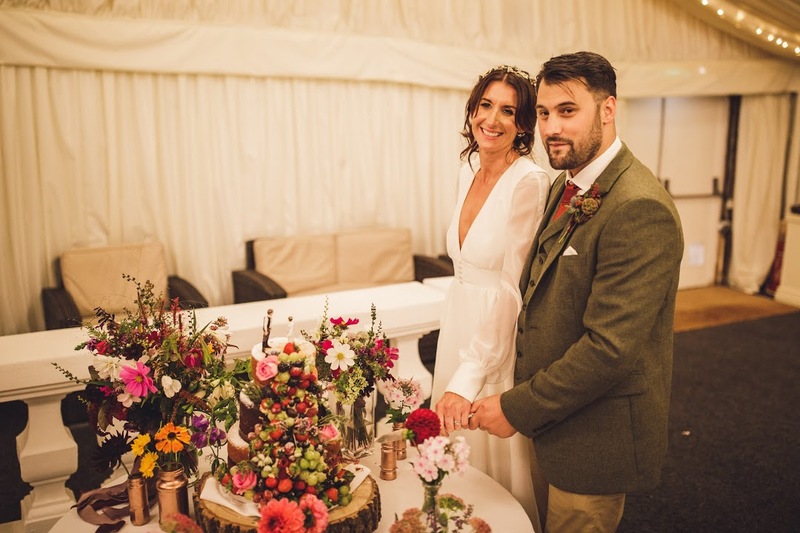 The couple both stayed the night before the wedding, enjoying breakfast in two sittings in the farmhouse dining room before starting preparations including hair and make up in the cottages. 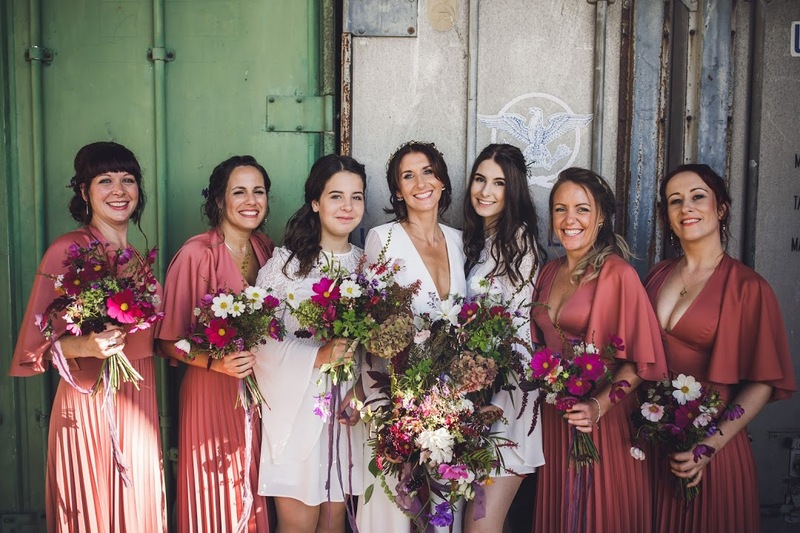 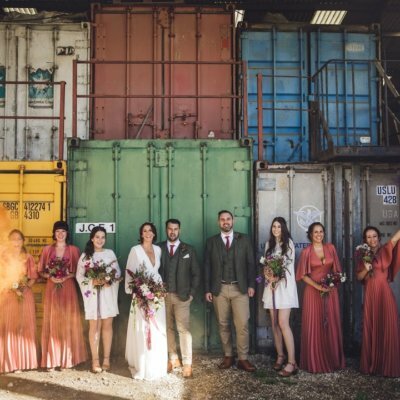 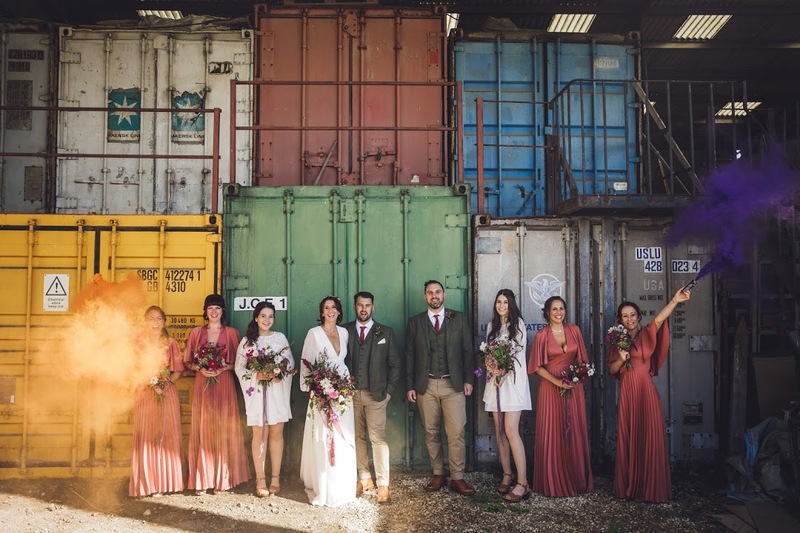 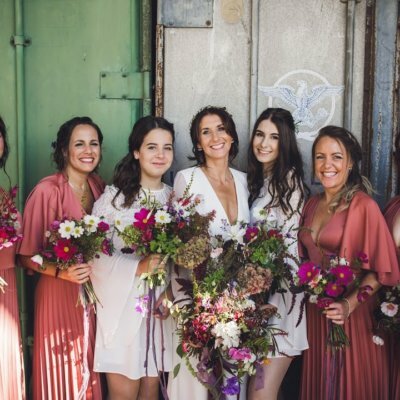 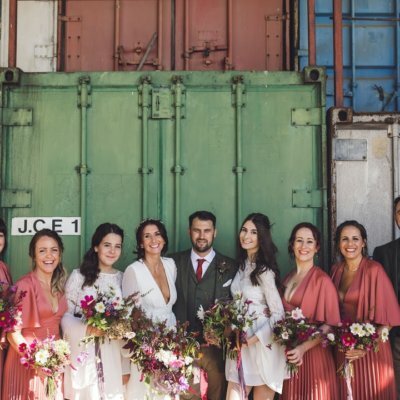 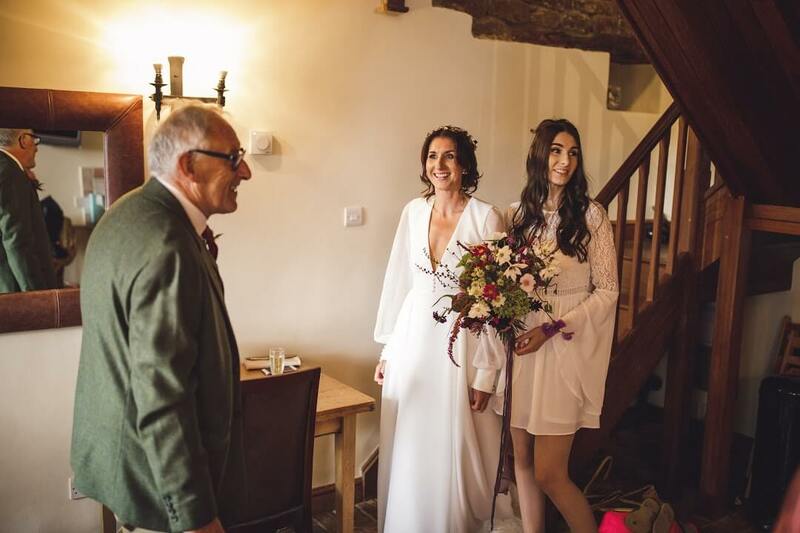 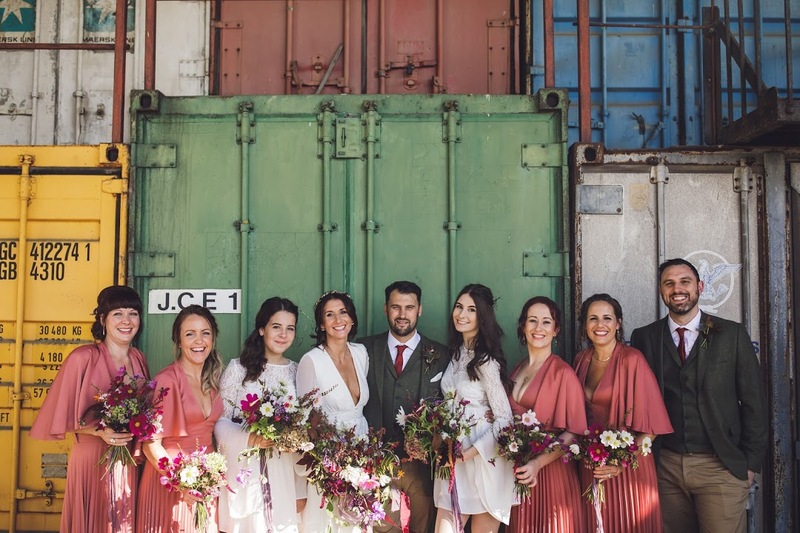 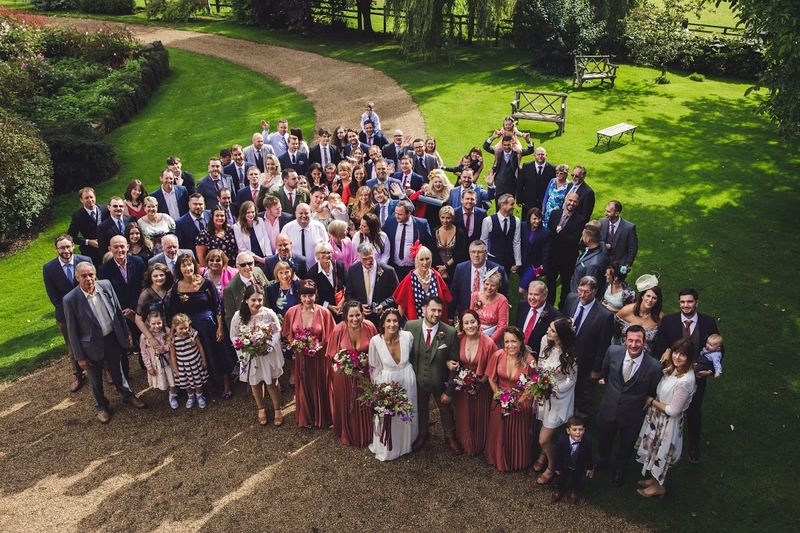 The bride wore an ethereal full length dress with delicate sleeves and an open back, with bridesmaids in peach complemented by the groomsmen’s tweed suits. 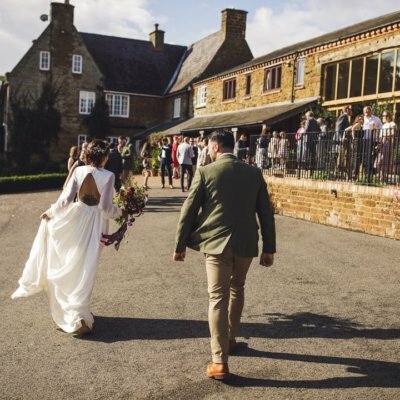 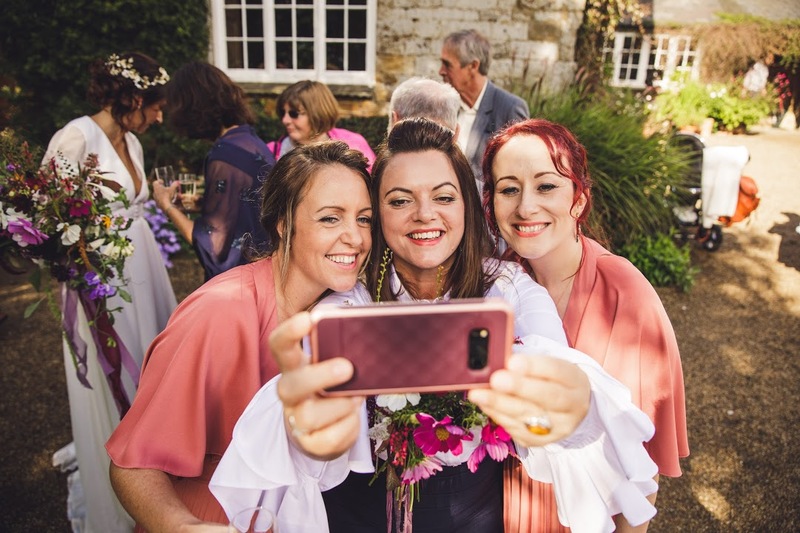 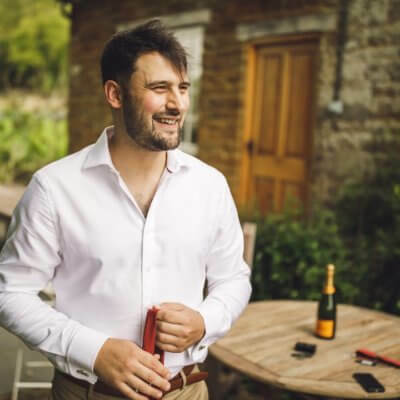 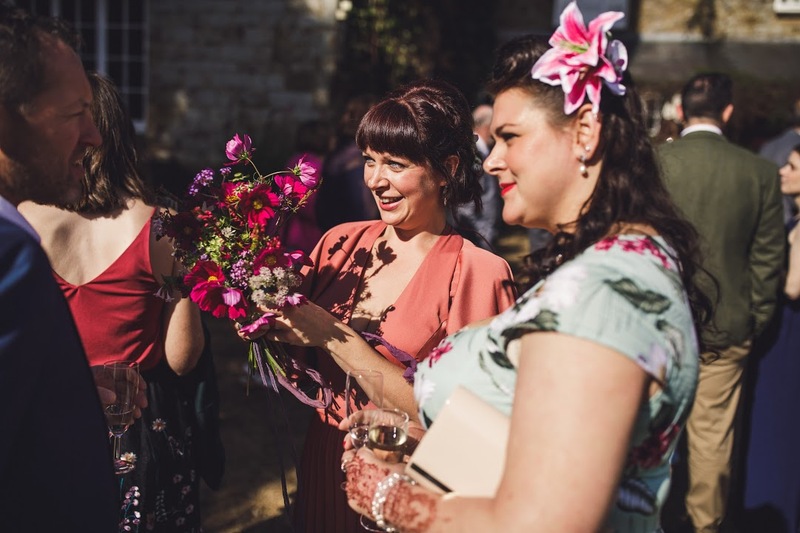 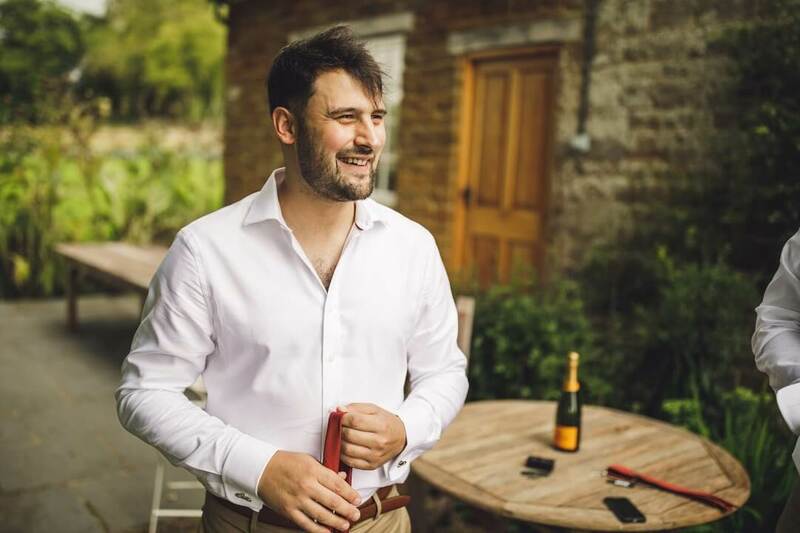 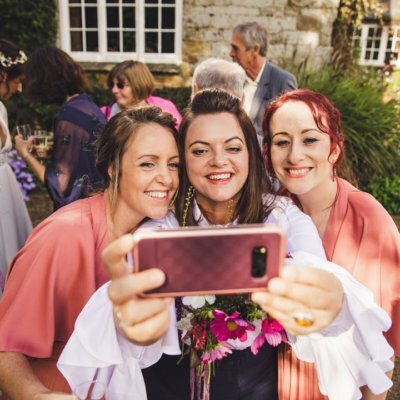 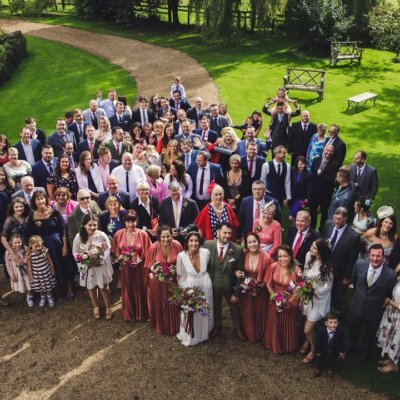 After an intimate ceremony, the rain cleared and the wedding party were able to go outside for photos outside the entrance in stunning light and a few drinks in the gardens. 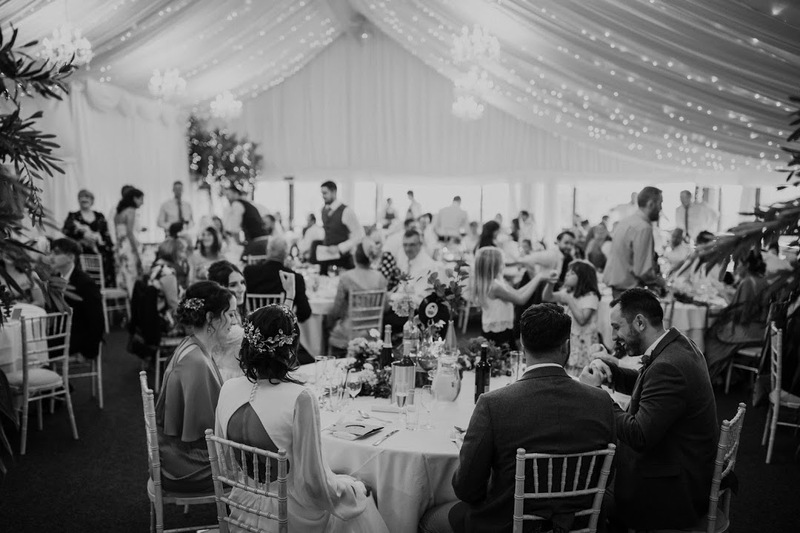 Guests were treated to a delicious barbeque from the Chopping Block as well as the couples’ signature cocktails: Cosmopolitan and Prosecco Bellinis with gin & elderflower. 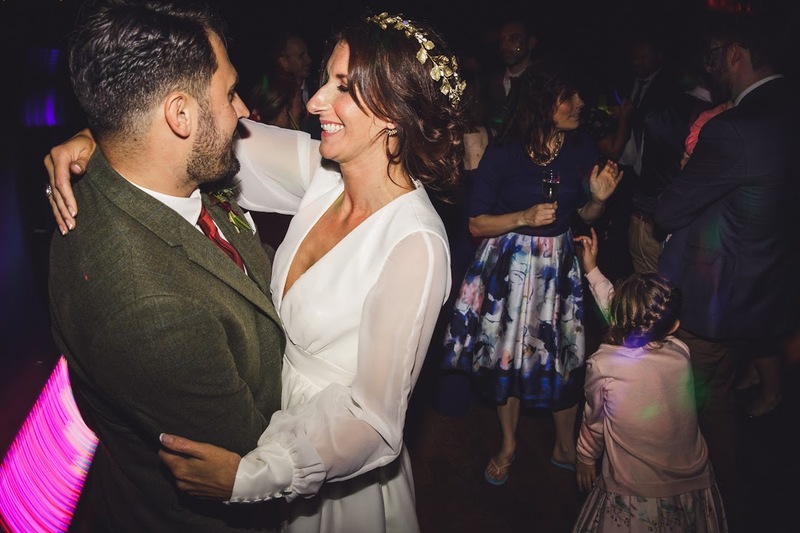 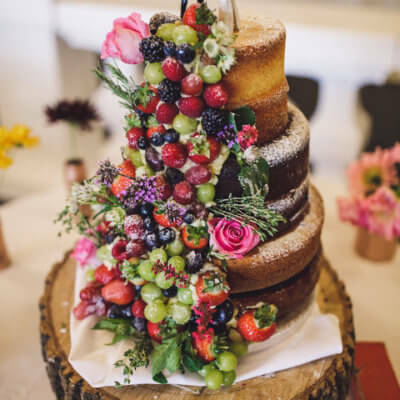 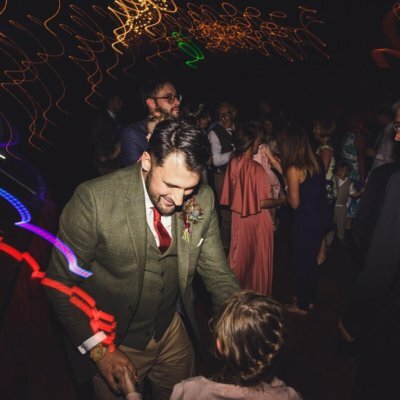 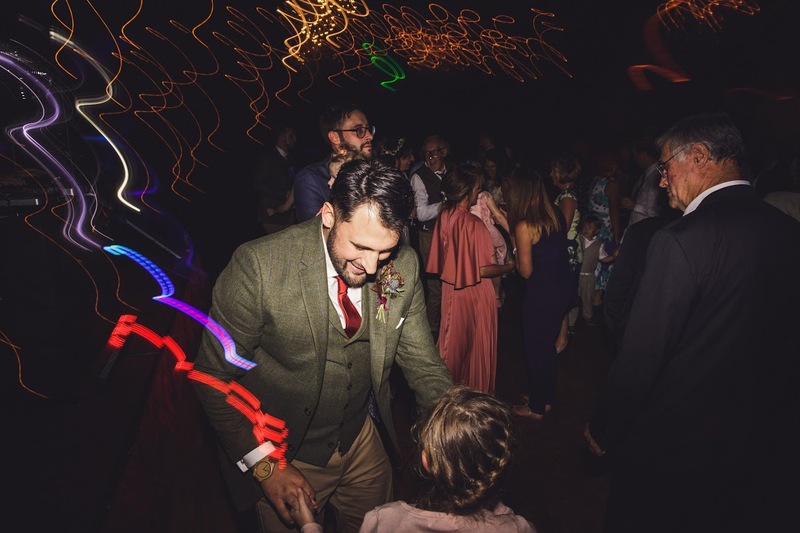 After cutting the stunning cake, which was made and decorated by the mother of the groom, the couple enjoyed their first dance as man and wife before Lois changed into a stunning one piece suit for the evening party. 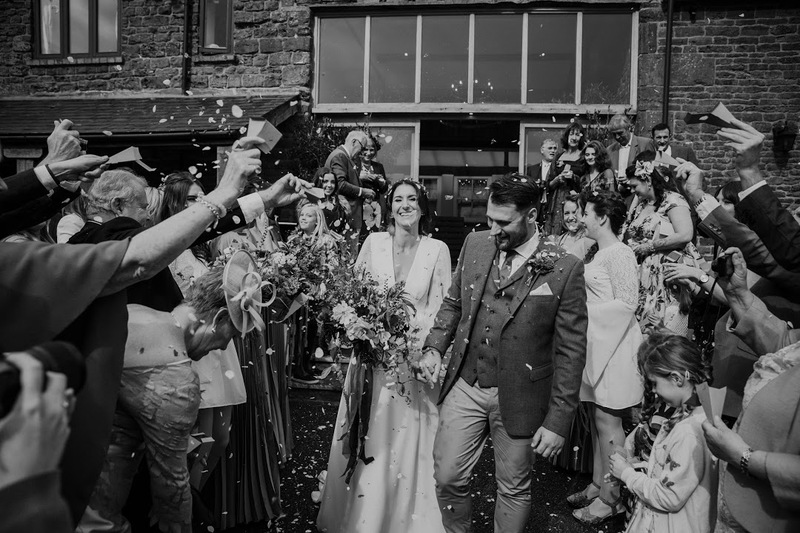 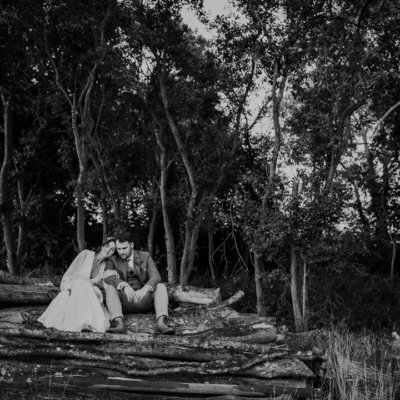 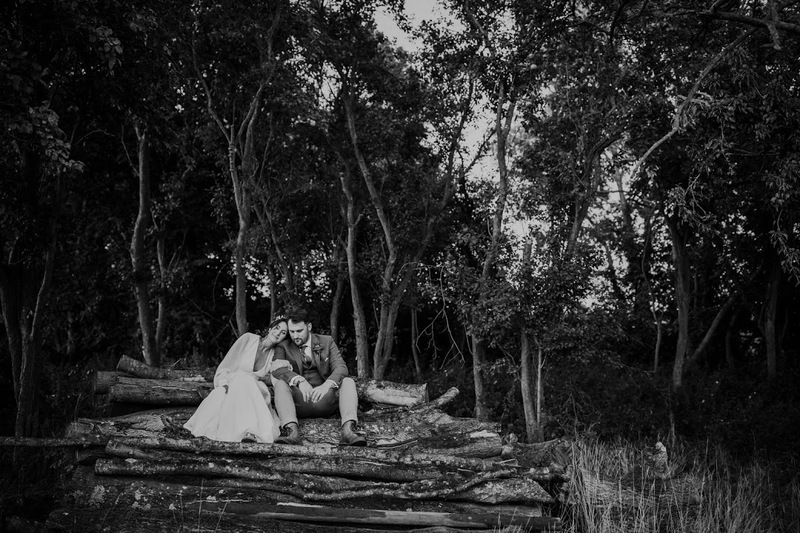 Huge thanks to Lois and Ashley and to their photographer, Matt Brown for allowing us to share a snapshot of their happy day. 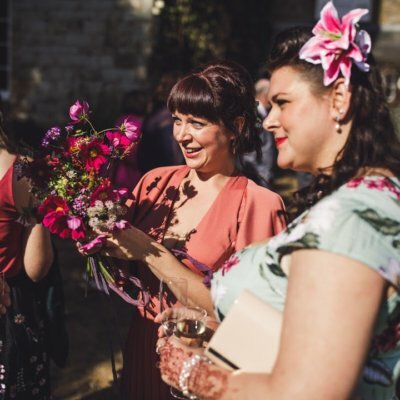 Hannah from All Of My Days also captured the day with this lovely video.